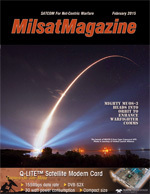 Mighty Muos-3 Effective Tac Coms Delivery For Warfighters, A step forward in this crucial direction for the United States is the recent launch of the U.S. Navy’s MUOS-3 satellite. As defined by the U.S. Department of State, there are currently 59 foreign terrorist organizations listed on the agency’s site. Designated as such beginning in late 1997 through August of 2014, these terrorist organizations present a dire threat to the United States and her Allies. As is typical with any large satellite network, not a month goes by without at least one of Intelsat’s more than 50 satellites having some sort of issue with connections to the terrestrial antenna network. Situational awareness is essential for warfighters involved in combat operations and critical for those responsible with force protection. 2014 was a very good year for space.